Inca sitting on his egg while Rayas keeps watch. How adorable is this?!! Once again, the claim that homosexuality is not "natural" is debunked. Good luck, guys! I'm sure you will be wonderful parents!! 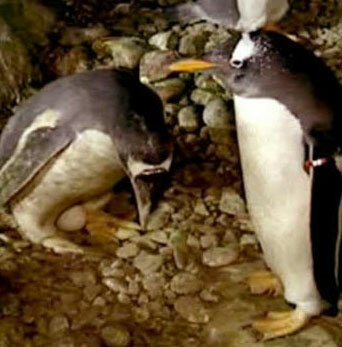 Inca and Rayas, a pair of Gentoo penguins at Madrid’s Faunia Park Zoo, have suffered from repeated heartache for a long time according to zookeeper Yolanda Martin. The pair had carefully built and lovingly looked after six nests, but sadly, those nests remained empty. According to Martin, Inca has taken on the “female” role of incubating the donated egg (that is due to hatch in June), and sits loyally on his child to be, while even turning down the chance to get his feathers wet with a refreshing swim. Meanwhile, his “husband” Rayas keeps a watchful eye on their nest and chases off any potential predators or gawkers.